Eric Fischer visualises Social Media. in his most recent series, See Something or Say Something, he places geocoded tweets and Flickr photos on the same map. Red dots are locations of Flickr pictures. Blue dots are locations of Twitter tweets. White dots are locations that have been posted to both. 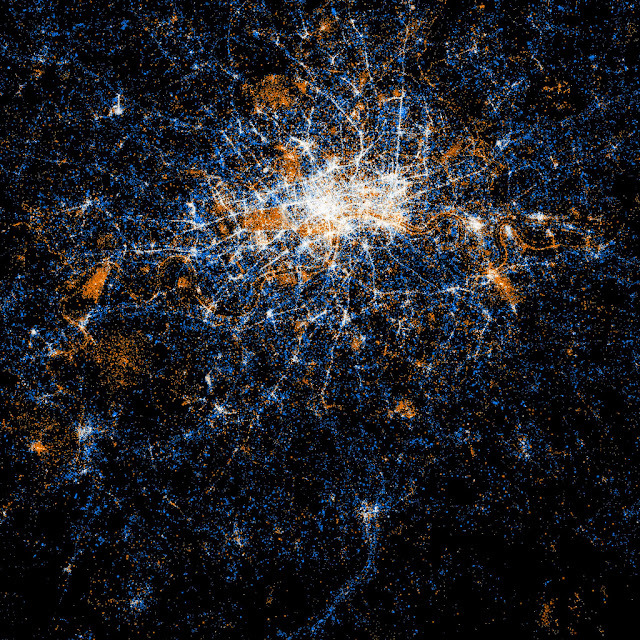 This above is a visualisation of London. Not surprisingly, you see a lot of white dots at the city centre. That's an artifact of population density and Flickr and Twitter users. What compels people to tweet over taking a picture and vice versa? Although, photo-heavy places just might be places that have things that are, well, worth taking pictures of. How does this help our Social Media efforts? Well for one we now have visible proof of people's connection with mobile / smart-phones and their desire to spread images and information about what they are doing, when they are doing it. For businesses within city centres (and the above example of London will be replicated in every UK city) then this is an opportunity. If so many people are tweeting and sharing images should you join in or ignore it?